wxCommander is a general purpose two-panel file manager for Windows.wxCommander comes with a few unique features (iso, a great text editor) and is built to last, created with the best software development tools available. There are countless applications that provide a wide variety of features to make file handling a little easier. 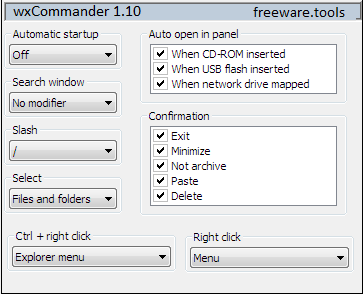 wxCommander is a file managing tool with an interface similar to the one of classic Total Commander. It supports dual panes, with each having a file viewer and folder navigator. The tool supports a lot of compression formats. The program comes bundled with a lot of useful functions which mainly cater to power users. For instance, you can change filename cases and lengths, create zero-filled files and backups, convert files to C-formatted text files, export a directory listing to file, as well as edit the Hosts file. wxCommander includes an internal text editor and viewer for images, archives and hexadecimal code. It is capable of displaying content for XML and HTML files as well. You can switch the main frame to full screen mode, create and edit menu items, mount and copy disk images, use the Windows search function, as well as view file history. It is also possible to swap or clone panels and create additional ones, compare directories and files, map network drives, synchronize the system time to online servers, use the Ping command, as well as set favorites. Furthermore, it can be asked to minimize to the system tray area on exit. The program has minimal impact on system performance, using low CPU and RAM. It has a good reaction speed and works well, without causing the operating system to hang, crash or show error messages. To sum it up, wxCommander mostly targets users with previous experience, offering a large variety of advanced features that need to carefully be managed. Tt manages to use little resources and ease your work in return.